Each massage therapy will include your choice of complimentary blended Aroma Oils either Floral Garden, Summer Morning or Blessing Day. Natural, soft therapy to reduce instant anxiety and boost full vitality. Hard pressure treatment designs to focus on releasing muscle aches and pains in targeted areas after sports. The heat from stones penetrates into muscle tissue allowing them to relax 4-5 times quicker than a standard massage, easing muscle tension and revitalizing muscle tissue by increasing blood circulation. 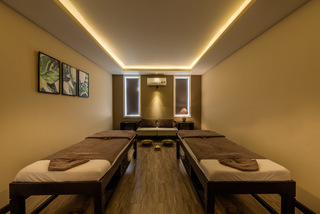 Body indulgence with complete exceptional massage therapy, personalized program for Palmarosa spa by an Australian acupunturist. Anti-jet lag massage remedy prevents the reoccurrence of time zone issue with concentration on head, neck and hand using herbal roll-on. Helpful support to reduce common prenatal pains for targeted areas including shoulder, lower back and calf. Infant massage provides positive tactile experience to soothe, relax and heal kids’ bodies. Organic ingredients within the oil would not affect the sensitivity of their skin. Foot massage with hotstone, special herbal foot soak and herbal pack. The Indian head massage is aimed at relaxing the body by reducing tension and stress of headaches,giving relief from eyestrain, lowering stress levels, decreasing anxiety and helping control and reduce sleep problems. Your massage therapist will be concentrates on these areas of the body where tension is most often stored resulting in stress build up by using traditional massage techniques to ease and release the muscles leaving the back, neck and shoulders relieved from tension and stress. This is super soothing for every tense, eaching, sore backs. The heat from the smooth stones really gets into the muscles to relax them, meaning you feel instantly better during and after treatment. An ancient form of "pressure therapy", this treatment involve applying focused pressure to certain known "reflex" points located in the foot, which correspond to specific areas in the body, return body balance and increase immune response. Using Skin care products by Render-vous. A relaxing facial customizes for normal skin type. Promoting a healthier, radiant and brighter looking complexion. The treatment is developed for sensitive, acne-prone skin with 100% organic, hypoallergenic products consisting of tea tree blemish serum to calm acne affection and reduce the appearance of redness and irritation. The treatment contains rich antioxidant nutrients to smooth the sign of wrinkles, lifting massage and firm the skin. The luxurious combination of ultimate facial treatment, plus Hyaluronic serum and another special serum depending on your skin type. The treatment is completed with the warm stone massage for neck and arms during your mask time. End up with application of Premium body lotion for the best result. Body wraps are designed to improve the texture and appearance of the skin by helping to rid the body of excess fluids and toxins. The benefits of body wraps may include body contouring, detoxification, skin tightening and skin softening. The formula consists of organic milk, honey, pound rice and sesame, suitable for combination and sensitive skin. This natural wrap stimulates your circulation, draws out impurities and leaves you a fresh body skin. Natural and effective clay mud purifies deeply into the pores, soothes the dryness as well as minimizes cellulite appearance. Along with lavender aroma enhancing the soul relaxation. Raspberry, yogurt and virgin coconut oil based treatment aims to soothe sunburned skin, prevent peeling and restore dehydrated skin. Our organic papaya contains vitamin C and other natural nutrients which helps to detox the skin without causing any irritations. The treatment is designed to improve the texture and appearance of skin by removing excess fluid and toxins from the body. Using only genuine OPI products.